Featuring a miniature cairn, this pendant reminds the wearer of those who have walked the paths before them. Forming a miniature cairn from found pebbles, this nature-loving pendant reminds the wearer of those who have walked the paths before them. Traditionally found on hiking trails, cairns mark a place in time for all to see. Artists Heather Goodwin and Kerry Alice Collins pay homage to this stacked sculpture by hand drilling each pebble and hanging the grouping on a delicate sterling silver chain. Handmade in Nahant, Massachusetts. Make it a set! 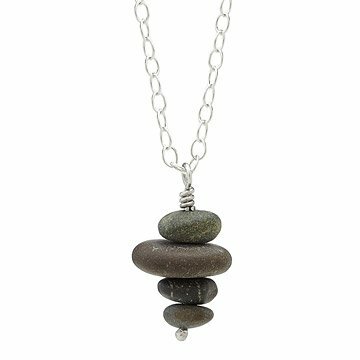 Pair this necklace with the Pebble Stack Earrings. Heather Goodwin and Kerry Alice Collins celebrate the beauty of nature with their earthy accessories. Their designs start with a hand-picked object-- twigs, maple seeds, acorns, sea glass, pebbles-- native to their home in the Atlantic Northeast. Every season brings new discoveries. These found treasures are then cast in sterling silver and bronze using their signature "natural burnout" casting method. This technique produces an exact replica of the object in metal, preserving its organic beauty. Very cute but the pebbles size was smaller than expected.